Before I had children, things like epsom salt and essential oils were not even on my radar, so I never imagined either becoming such a vital part of our routine as a parent. In fact, I was probably even skeptical of their benefits. But that was nearly ten years ago. Now I'm no longer a skeptic. When it comes to parenting, I'm choosing to embrace the theory of "try everything and anything until you find something that works." Especially when it comes to parenting a child with special needs. So when we encountered wait list after wait list while trying to get my son assessed for autism, I started reading about, learning about, and trying an assortment of natural and alternative treatments. I was hoping to find something - anything, really - that would have an impact on our day to day life and make days with autism and sensory issues less challenging for all of us. We found lots of wonderful things that worked, two of which were essential oils and detox baths. So I squashed my inner skeptic and here I am over two years later, incorporating both essential oils and detox baths into our daily and weekly routines. 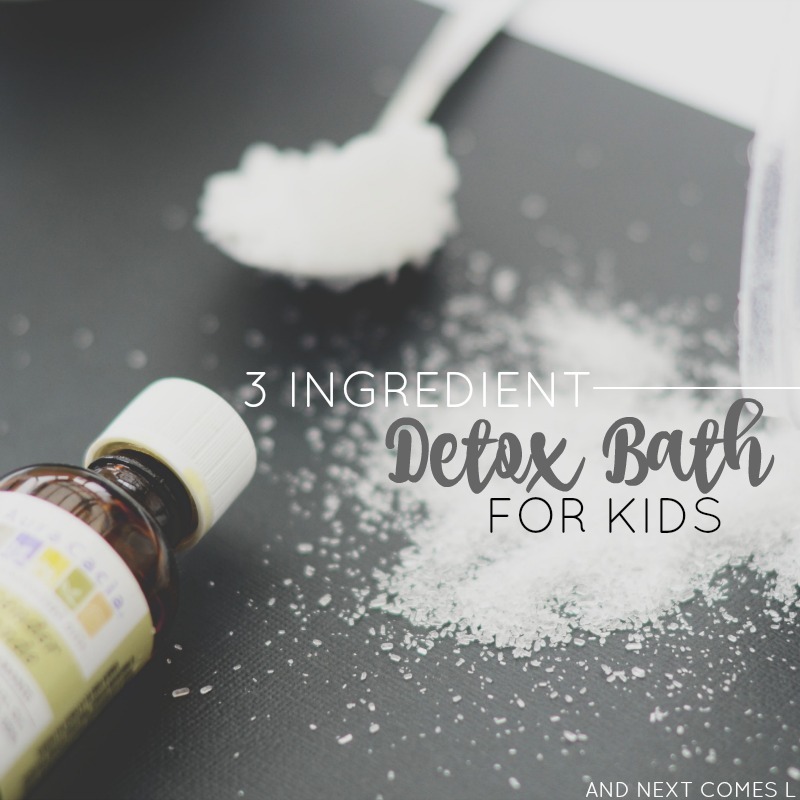 For our family, a weekly detox bath has had a tremendous impact on our kids. Not only do they sleep better after a detox bath, but they seem more focused and alert for the days afterwards. They seem more in tune with themselves and better able to concentrate. And they seem to get sick less often. 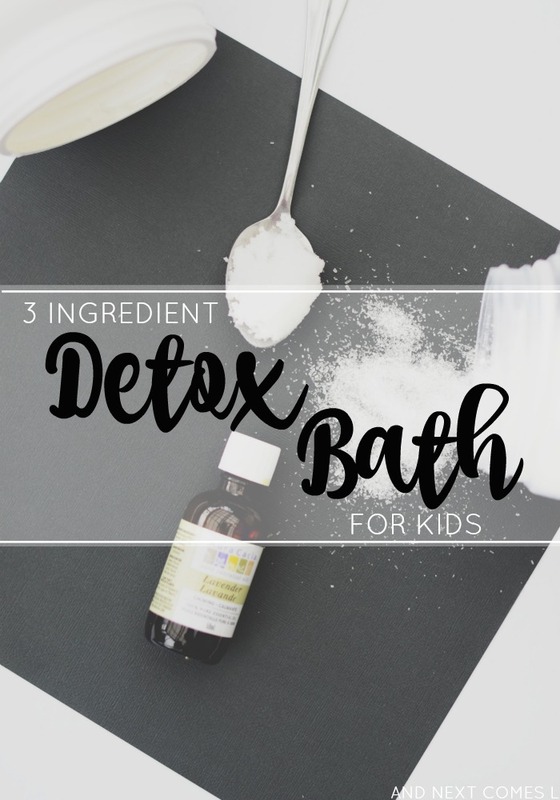 Detox baths for kids are simple to do and only require adding three ingredients to the water in the bathtub. Detox baths are also inexpensive as the ingredients will last you months, meaning you can get in lots of detox baths before you need to stock up on supplies. There is also some evidence to suggest that children with autism benefit from detox baths with epsom salt. I know that we, personally, have seen a dramatic improvement in our son when we do these detox baths. He just seems more in sync or "with it" in the following days. You can read more about how epsom salts may be useful for children with autism here. While the bathtub is filling up with warm water, add the ingredients above (in no particular order). Then swish your hands through the water to mix. Make sure the epsom salt is fully dissolved and that there are no floating chunks of coconut oil. Let the kids soak (or play or gently splash) in the detox bath for a minimum of 20 minutes. Do not let your kids drink the bath water. Avoid getting the bath water in your child's eyes. Detox baths can make kids thirsty so be sure to provide plenty of water to drink either during the bath or afterwards. Skip the soap and shampoo on detox bath night for two reasons. One, the oils make their hair extremely greasy. Two, you want the kids' pores to absorb the benefits of the epsom salt and essential oils, not the chemicals in the soap and shampoo. Detox baths work best in the evening, right before bedtime, because it promotes relaxation and sleep. I am not 100% sure if it will be safe for that age group, especially the one year old, so I don't want to say it is, in case I am wrong. Remember, I'm still learning about essential oil safety too! If you are just getting started with essential oils with your kids, then I highly recommend checking out the websites learningabouteos.com and usingeossafely.com. Both websites have wonderful information about using essential oils safely.